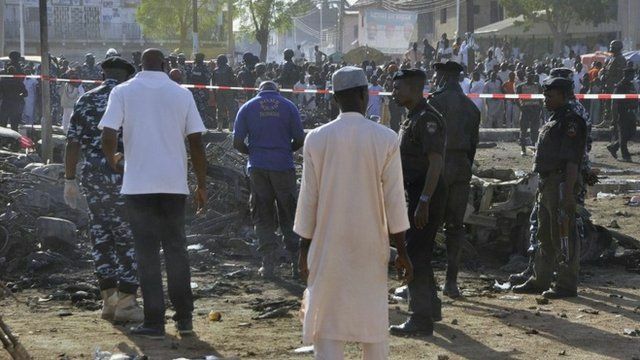 Dozens die in Nigeria mosque attack Jump to media player Many people have been killed in a gun and bomb attack during Friday prayers at one of the biggest mosques in the Nigerian city of Kano. Nigerian army 'retakes Chibok' Jump to media player The Nigerian army says it has recaptured the north-eastern town of Chibok, which was seized by Boko Haram militants on Thursday. I deserve my nomination - Enyeama Jump to media player Nigeria's Vincent Enyeama feels that he deserves a place on the shortlist after a 'great' year. Record number of women in the UN Jump to media player More than a third of the United Nation's Security Council is made up of women. Will this impact global diplomacy? Dozens of people have been killed in three explosions and a gun attack during Friday prayers at one of the biggest mosques in the Nigerian city of Kano.